Do you have floor joists in your crawl space that look like the one to the right? When you do, you'll notice the 'furries,' as one of my friends called the microbial infestation growing on that wood. What's going on here? Why is stuff growing on the wood down in the crawl space? Spores - They're everywhere and will grow if the other conditions are met. Appropriate temperatures - They like pretty much the same temperatures we do, and even colder. Ever seen mold in your fridge? Food - Organic matter is what they like, and it's everywhere. Mold likes cellulose (wood) and the more processed, the better. Paper is called mold candy by people who work in this field. Moisture - To sustain growth, a mold colony must have water. When the relative humidity of the air is 70% or higher, mold has enough water to grow. So, of the four requirements for mold growth, the one we have most control over is moisture. Keep the materials and the air dry enough, and we won't have a mold problem. Have you measured the relative humidity in your crawl space? When I was doing improvements on homes, I'd install a digital thermo-hygrometer with a remote sensor in the crawl space so the homeowners could track the relative humidity. If you're not doing this yet, and you have a crawl space, get yourself one of these devices now. OK, so you've measured and determined that you do have high relative humidity in your crawl space. That's not unusual at all, especially in a humid climate like we have here in the Southeast. Where's the moisture coming from? And why is the humidity in a vented crawl space higher than the outdoor relative humidity? Here are three reasons. The first problem to look for is bulk water. If there's standing water in your crawl space, you have either a drainage problem or a plumbing leak. You need to fix this immediately. Having a pond under your home is a bad, bad idea. In the photo above, the problem was that the back yard sloped down to the house, bringing water up to the foundation wall. Since it was just a crawl space, the builder didn't put any kind of water proofing on the concrete block or grade the yard properly to keep the hydrostatic pressure from building up against the block wall. You can see the result here. This was a new house with a serious bulk water problem. The joists were already growing stuff, and the fiberglass batt insulation was getting heavy and falling down. 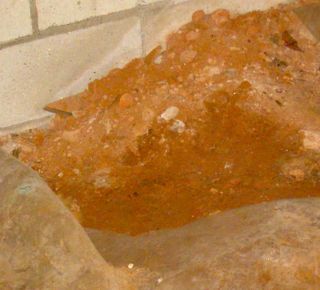 In the photo above, the ground was partially covered with a polyethylene vapor barrier. The dirt that wasn't covered looked dry, but when I pulled the plastic back, I found that there was a lot of moisture in that soil. The soil that looked dry only looked that way because it was constantly evaporating moisture into the air of the crawl space. The foundation walls can also evaporate moisture into the air. What do you do to solve the problem? Cover it all up with a vapor barrier! Some people find this hard to believe, but when you bring outdoor air into the crawl space, the relative humidity actually increases. Think about it this way: When air enters the crawl space, it cools down. Cool air cannot hold as much moisture as warm air, so the air that enters is now closer to its saturation point (which we call the dew point). It might've been 60% relative humidity outside (relative to a temperature of 90° F, say), but when that air came into the crawl space and cooled down to 75° F, the relative humidity jumped up to 95%. Not good! The numbers here come from the psychrometric chart (invented by Willis Carrier, the inventor of the modern air conditioning system), which relates temperature and humidity of air. If you've got a vented crawl space with high relative humidity caused by one or more of the above, to solve the problem, you've got to remove the causes. Bulk water is solved by fixing the drainage or plumbing problems. Water evaporating from the ground or coming through the vents can be fixed by encapsulating your crawl space. One thing that does NOT work is to try to treat the symptom by installing a dehumidifier. Don't do that!